Coach Hermann works with an athlete during practice. 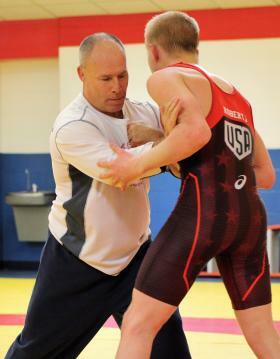 Marquette, Mich.—The Northern Michigan University Olympic Training Site Greco-Roman wrestling program will hold a United World Wrestling senior-age camp Dec. 16-22. The camp will provide two training sessions each day with multiple match opportunities during the week and will be led by NMU-OTS coaches Rob Hermann and Andy Bisek. The OTS Greco team has also added two Big Brother camps that are taking place March 25-29 and April 15-19. The U16 and junior-age camps will give athletes the opportunity to be mentored by college-age athletes as they train alongside of them during practices. NMU-OTS coaches and athletes will also hold separate technique practices for the younger athletes. The date has also been set for the annual Superior International Wrestling Camp. The camp, which is typically held in early June, will take place June 24-29 in 2019. Camp and registration information can be found at www.nmu.edu/ots.